Sporting a unique look that certainly marks it out from other vehicles in its class, the Skoda Roomster manages to show that being practical doesn't have to mean being dull. This spacious mini-MPV boast a large cabin and boot thanks to its unusual exterior dimensions, and is a real pleasure to drive. 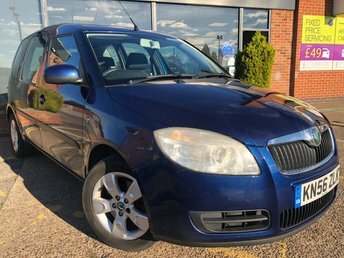 Why not come and discover the range of used Skoda Roomster models for sale in Nottingham for yourself by paying a visit to our showroom. At Lowdham Cars every vehicle on our forecourt has been tested by a trained technician, allowing you to buy with complete confidence. Speak to a member of the friendly showroom team for more information. Finance is available to UK residents aged 18 years or older, subject to status. Terms & Conditions apply. Indemnities may be required. Other finance offers may be available but cannot be used in conjunction with this offer. We work with a number of carefully selected credit providers who may be able to offer you finance for your purchase, commission may be received. We are only able to offer finance products from these providers. Postal Address: Lowdham Cars, Lowdham Road, Gunthorpe, Nottingham, Nottinghamshire NG14 7ES. Find contact details here.